A Powwow celebration at F.W. Howay elementary school. Lee Laufer teaches carving after school...He's part of the Aboriginal Education team. What if someone came and took your child? November 2017 – Canadians are just starting to come to grips with the country’s history with Aboriginal peoples — and at New Westminster Schools, the first steps of the journey are underway. From Pow Wow dancing to salmon feasts, and from smudges to traditional rites of passage, students across the district are increasingly experiencing the living cultures of First Peoples. They are also starting to experience Aboriginal ways of learning and knowing in all subject areas, a key component of BC’s redesigned curriculum. Richard McBride and F.W. Howay elementary schools each held an “Aboriginal Awareness Week’ last year that involved every student in the school joining hands in powwow dancing or taking part in school potlatches. 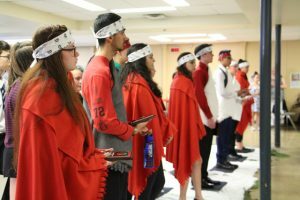 At Richard McBride, a dramatic artificial fire ‘burned’ in the centre of the gymnasium as students grouped in earth, air, and water clans danced and shared traditional foods together. They were guided in their celebration by Coast Salish guests who drummed and sang in their traditional Sḵwx̱wú7mesh (Squamish) language. At FW Howay, members of the Wild Moccasin Dancers led 135 students and staff assembled in the gymnasium last June in a whole-school Pow Wow dance – followed by a feast of salmon and bannock. 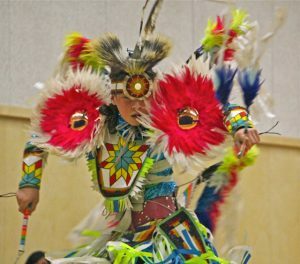 The magnificent regalia worn by the young Pow Wow guest dancer featured 25 pounds of hand-sewn beadwork — adding to the impressive endurance in his high-energy fancy dance performance. For students, the experiences were the culmination of a week of hands-on learning about Canada’s Aboriginal peoples. Both events benefitted from the strong support of each schools’ Parent Advisory Committees – and more is planned for this year. 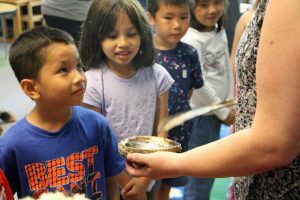 At Queen Elizabeth School in Queensborough, Jenny Thompson’s kindergarten students and parents voluntarily joined the district’s first-ever indoor smudging ceremony at the end of June. As the pungent smell of sage and sweet grass filled the classroom, the children were clearly filled with wonder, curiosity, and respect. 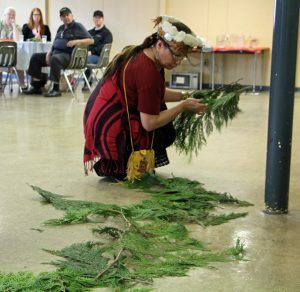 For Aboriginal Education support worker Ros Swanson, who performed the ceremony, smudging is a chance to share an Aboriginal tradition focused on healing and cleansing. For the school district, support of smudging is one way to give students the opportunity to learn about the roles of First Nations, Métis and Inuit peoples in the past, present, and future of Canada – and to create inclusive and culturally responsive schools for all students. More and more, teachers are embedding culturally relevant approaches to teaching and learning in their daily classroom activities. 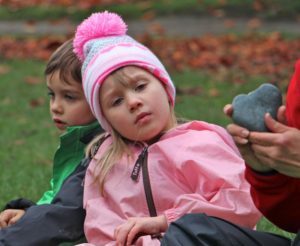 At Connaught Heights elementary school, a year of outdoor learning in teacher Laurie Wong’s weekly kindergarten “Forest Friday” classes included the traditional talking circle along with myths and stories. The children also learned to count from one to ten in Nuxalk, thanks to the district’s Aboriginal Education Co-ordinator Bertha Lansdowne whose family is from Bella Coola on the Central West Coast. At the high school level, seven classes of students keen to hear and learn about an Indigenous language were introduced last year to Halq’eme’ylem through guest visitor Dr. Ethel Gardner. She played a key role in revitalizing the traditional language of her Sto:lo people of the region, and in doing so demonstrated the connection between language and worldview. Many teachers are finding guidance for their classroom explorations in resources like the First Peoples Principles of Learning, which recognize the connections between the natural world and identity, the role of different generations in learning processes, or the significance of traditional ecological knowledge, a perspective that can help inform understanding in subject areas like the sciences. 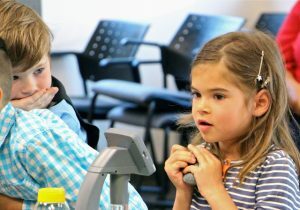 Still others have launched action research projects with the help of innovation grants from the New Westminster school district, encouraging teams of teachers to discover new and creative ways to support student learning. Several of the 17 grants last year supported projects inspired by Aboriginal learning principles. High school teachers M.J. Hunt, Trevor O’Rourke and Satnam Sangra launched the “Identity Project,” giving their classes the opportunity to ask “What does it mean to be Canadian?” Students explored their journey to New Westminster, and through the sharing of language, culture and personal history – as Indigenous, settlers, newcomers or visitors – they were better able to articulate their Canadian identity in relation to a blended social history. A highlight for teachers and staff at the district’s professional development event earlier this year was nationally recognized First Nations artist Carey Newman. Newman created the monument known as the Witness Blanket, made up of 877 objects that survivors associated with their experience of residential schools in Canada. As the keynote speaker, he offered his insights to staff and teachers as the district begins to integrate Aboriginal culture and perspectives across all areas of learning in BC. New Westminster Schools is also committed to improving school success for its more than 300 Aboriginal students. An Aboriginal Education teams helps students develop pride, confidence and self-esteem through identification with their ancestry and success in their academic learning. The Qayqayt Honouring and Rite of Passage ceremony recognizes and honours important school transitions in the lives of Aboriginal learners and takes place annually. The ceremony marks the shift from kindergarten to grade school, from grade 8 to high school, and from high school graduation to the life a young adult. The solemn rite incorporates cedar branches, ceremonial blankets, drumming and singing to honour the students whose achievements are witnessed by families, friends, and supporters – and by teachers, school principals, the district Superintendent, and trustees. “We were proud of them and they should be proud of themselves,” she said. The district is guided in its cultural, social and academic support of students by the Aboriginal Education Advisory Committee – which includes Qayqayt First Nation Chief Rhonda Larrabee, a devoted and passionate supporter of education in the district. In addition, the new district role of graduation coach provides academic support for students in grades 9 to 12, part of a team of Aboriginal Education support workers, counselors and administrators working together to make sure students are charting a path to success. But along with the experience of a vibrant and living culture is a growing understanding of the painful past. Sarah Wethered spent last summer reading at least 15 first-person accounts of people who went to Canada’s Indian Residential Schools as she helped researched resources for teachers to use in their classes. “It absolutely shocks me every time,” said the teacher librarian at New Westminster Secondary School. Wethered introduces many of her social studies classes to books that feature the authentic voices of those whose have survived residential schools. For one of her social studies classes, she picked up the book: “I am not a number” by Kay Dupuis. And with no introduction or explanation, she read the children’s story to her grade 10 students. In confronting the historical injustices of the past, the role of the public education system is key. This week, the New Westminster Schools Board of Education declared Orange Shirt Day honoring survivors of the residential schools as an event lasting for the entire week. 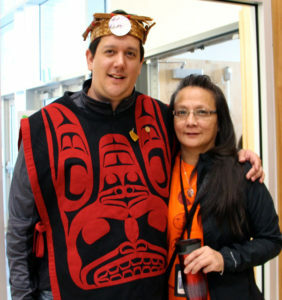 “The purpose of the week isn’t just to wear an orange shirt – but to be a marker of advances of the work that Truth and Reconciliation Commission is calling for – and for our schools and community to be a welcoming and inclusive learning environment for Aboriginal learners and for all kids,” said school board vice-chair Mark Gifford. The national movement honors the experience of survivors of Indian residential schools and their families. It was started in 2013 by Phyllis Jack Webstad, of the Stswecem’c Xgat’tem First Nation near Williams Lake B.C., in memory of her first day at residential school in 1973. A critical step in on the path to reconciliation is making sure that voices are heard. 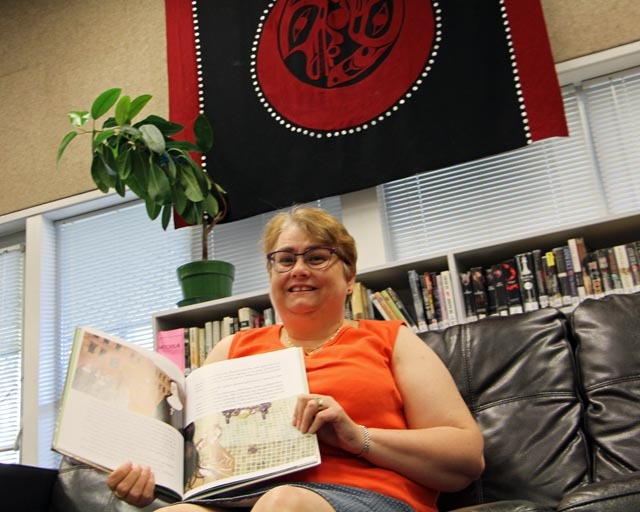 Wethered and NWSS librarian Lorena Jones spent the summer evaluating First Nations resources for the high school’s book bins on first Nations issues, available for teachers to use across multiple subject areas. In honour of Orange Shirt Day, Wethered and Jones will be hosting a Book Talk event on October 5, inviting teachers and their classes to discover resources supporting learning, teaching, and exploration. The bins feature everything from graphic novels to the United Nations Declaration on the Rights of Indigenous Peoples – although Jones notes that as teachers begin to incorporate Aboriginal perspectives throughout the curriculum, there will be a pressing need for more resources, particularly in the sciences. For Wethered, reading is a gateway to facing Canada’s past. She grew up in Duncan in the 1980s near the largest ‘Indian reserve’ in B.C. and never learned a thing about the First Nations in her vicinity. 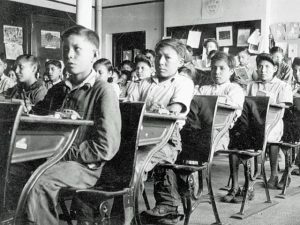 She said that students often have visceral reactions when they learn of the residential school experience of young Aboriginal children – including the idea that children would be punished for speaking their Indigenous languages, or have their hair cut off, or be refused access to their families is often shocking. “Every kid can understand being homesick, or not being able to see your parents. What if you were ripped from your family and sent away and not know when you are going to see them again?” Wethered said that for 30% of her students, English is not the first language, and that they can relate to the fear of such an experience. She also finds that in her social studies classes, the learning journey into Canada’s Residential Schools allows students to begin to grapple with social justices issues more generally. “Students are learning compassion and empathy as they confront the experiences other peoples. And that becomes the basis for asking about social justice issues in Canada more broadly – about the Komagata Maru, the Japanese internments, the Chinese head tax, the turning away of the St. Louis,” a ship carrying Jewish refugees from World War Two who were refused entry to Canada. Wethered’s students have also looked at official government apologies for past injustices and asked: what makes a good apology and why. 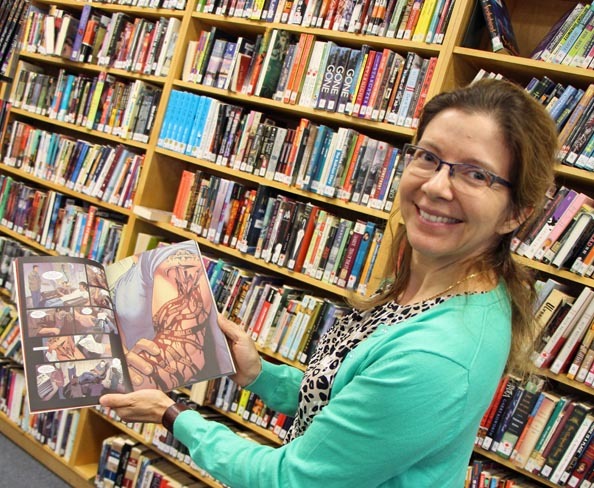 For NWSS librarian Lorena Jones, graphic novels are a particularly engaging resource to meet the diverse learning needs of high school students. Among the media centre’s culturally relevant resources, she highlights a graphic novel that tells the story of an Aboriginal youth from a broken family who ends up in jail. “He goes through a lot of soul searching and what he discovers is healing and resilience instead of punishment and self-loathing – the traditional Eurocentric approach to incarceration.” She said the book is based on a dissertation by a non-Aboriginal author, but uses art and image, dialogue, action and symbolism to tell the story. “I’m looking for authentic resources that are accurate, rich, free of bias and stereotypes, and that can be read on multiple levels. This book could be read as a universal story about a man seeking to establish his identity, overcoming his challenges and surviving. From that perspective, it appeals to everyone, so it’s a point of entry into the specifics of Canadian and First Nations history. Jones said that fundamentally, education helps expand student worldviews to an understanding of how we construct knowledge. Jones said educators know the best way to teach is to incorporate multiple world views – and that’s a significant shift from the one worldview the school system has traditionally transmitted.